Fantasy Flight Games posted up a new preview that delves into some of the nuts and bolts of Star Wars Armada. This game can't get to my tabletop fast enough. What do you think? Do the rules as previewed seem to create a game that flows like an "actual" space battle would (of course, we all know that no real space battles are going on right now... ... ... that we know of... but it's fun to speculate), but also in a way that creates a fun gaming experience? Welcome to our first preview of Star Wars™: Armada! Armada is an epic, two-player miniatures game of large-scale fleet battles set in the Star Wars universe. The time is the height of the Galactic Civil War. As the Imperial Navy’s Star Destroyers move systematically across the galaxy to impose order and crush those who would oppose the evil Galactic Empire, the Rebel Alliance launches its rag-tag fleet of ships and starfighters on daring raids and surgical strikes. Its aim? Weaken the Empire, blow by blow. In Armada, you enter this ongoing conflict as a fleet admiral with either the Imperial Navy or Rebel Alliance. Your ships have come upon the enemy. Conflict is imminent. Thousands of crew race to their battle stations, preparing for massive exchanges of turbolaser fire. Thousands will die, but it is your job to command the fleet to victory. You must overcome your foes. You must achieve your objective. There is no room for failure. 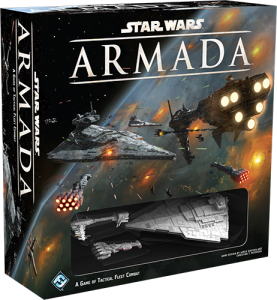 Even though Armada is a game of capital ships and starfighter squadrons – with battles on a scale large enough to alter the fate of the galaxy – their outcomes still hinge upon you and your decisions. If you wish to emerge victorious, the first thing you’ll need to do is learn how your ships function in battle. Capital ships aren’t nimble like starfighters. In fact, the larger and more powerful your ships, the more time they take to respond to your commands. You can’t react instantly to threats as they arise. You have to plan for the future.